This was supposed to be the Fiesta Bowl Boise State would not win. This was supposed to be the splash of cold water on an afternoon in suburban Phoenix when — interestingly enough — the weather outside University of Phoenix Stadium in Glendale was cold, gray, and wet. This was supposed to be the main-event bowl game Boise State would not solve, the game in which this program’s Glendale Magic ran out. This time, Chris Petersen was not the Broncos’ head coach. This time, the Broncos didn’t come into the Grand Canyon State with a huge early-season win over a formidable team (Oregon in 2009). This time, the Broncos weren’t playing a member of a non-Power 5 conference (TCU in the 2010 Fiesta Bowl). As unproven as Arizona has been in its largely snake-bitten football history, the Wildcats were supposed to beat Boise State and take their place as one of the more decorated teams in the life of the program — not quite at the level established by the 1993 and 1998 teams, but close. Rich Rodriguez, after seeing his offense get stuck against Oregon in the Pac-12 Championship Game, had nearly four weeks to make tweaks and get Anu Solomon in the proper frame of mind. Given that Boise State fell well short against Ole Miss in its big non-conference test — yes, the same Ole Miss team that was eviscerated by TCU in the Peach Bowl — why was this non-conference game against Arizona supposed to be different? The Broncos looked ordinary — sufficient, yes, but ordinary — in the Mountain West Championship Game against a Fresno State team that finished its season at 6-8 with a listless loss to Rice in the Hawaii Bowl. Could the Broncos radically elevate their level of play and bank on Arizona to be sluggish enough to lose? The story of Boise State’s 38-30 win over Arizona is a supremely impressive one for a few core reasons, but at the heart of this Fiesta Bowl lies a core truth: Boise State has built its brand beyond Chris Petersen. Interestingly enough, Petersen’s in Phoenix this week, because on Friday, Jan. 2, his Washington Huskies take on Oklahoma State in the Fiesta Bowl’s former site, Sun Devil Stadium, on the opposite side of town. Petersen’s sustained excellence in Boise was so pronounced in quality that the Bronco fan base was panic-stricken about the idea that Petersen would leave. Once that finally happened, it became impossible to deny that a sense of anxiety about the future of the program had developed. Yes, Boise State did get to this grand stage in the desert once again, but a blowout loss to Arizona would have clearly sent a message: Boise State’s not quite what it once was. It’s true that the Broncos were playing with house money in this game — unlike 2007, when they absolutely had to prove themselves in a way Hawaii failed to do in the 2008 Sugar Bowl against Georgia — but the need to provide a credible showing still existed, especially after losing twice in the regular season by double-figure margins. Coach Bryan Harsin was on Petersen’s staff for the 2007 and 2010 Fiesta Bowl wins, but he needed to make his own mark as a head coach in order to create a new reality: Boise State is bigger than one coach, and could be rebuilt after Pax Broncomania, the empire-like reign of Petersen with Kellen Moore as his field general. That, right there, is what this victory has achieved. The Boise State brand name is durable and resilient, given a fresh injection of longevity. The Broncos didn’t settle for a 2-1 Fiesta Bowl record or a moral victory. They did the darn thing AGAIN… without Chris Petersen. There are other reasons to herald this triumph for the Broncos, and they’re almost as impressive in isolation as Boise State’s collective feat. 1) The defensive line starred. The defensive line, as a complete team unit, was the pillar of the program’s excellence in the Petersen-Moore years. A nasty front four which could generate a strong and consistent upfield push enabled the rest of the defense to tend to its assignments and remain organized in coverage. Whenever Moore faltered in his four years as BSU’s quarterback (those moments were rare, of course), the defensive line picked him up. Whenever the Broncos’ offense stalled, the defense — in sudden-change situations or simply when the run of play was beginning to shift against Boise State — stood tall, anchored by that front four. You could clearly see in the fourth quarter that despite mounting fatigue, Boise State was able to generate pressure with its base front four, removing the need for blitzes that left Arizona receivers open on short routes. The Broncos resisted the temptation to (over-)blitz and gave Wildcat quarterback Anu Solomon few options down the field, especially on third downs. Arizona was just 7 of 22 on third downs. Boise State’s defensive line: once an anchor, always an anchor. That’s another part of an enduring football identity. 2) The Broncos didn’t even play their best. How many mistakes did the Broncos commit — and not just small ones, but huge ones? Jay Ajayi — who was very good (though not great) in this contest — committed a fumble just when Boise State was on the verge of sealing a much less dramatic victory, up 38-27 early in the fourth quarter. A trick-play pass should have produced a touchdown of 78 yards, but the throw was errant. An unnecessary pick play when a receiver had broken wide open cost Boise State a third-down conversion in the fourth quarter. A receiver stumbled in the open field one yard short of the first-down marker with Boise State trying to protect an eight-point lead inside the six-minute mark of the fourth quarter. Chop blocks, face-mask penalties, an interception by quarterback Grant Hedrick… Boise State could have scored over 50 points in this game with just a little more attention to detail. Yet, all these mistakes didn’t matter. Boise State was able to beat Arizona without playing anything close to its best game. The Broncos were, however, able to be great in the areas of the field — and in the parts of their roster — which mattered most. 3) Grant Hedrick has come a long way, and he performed well away from home in this game. 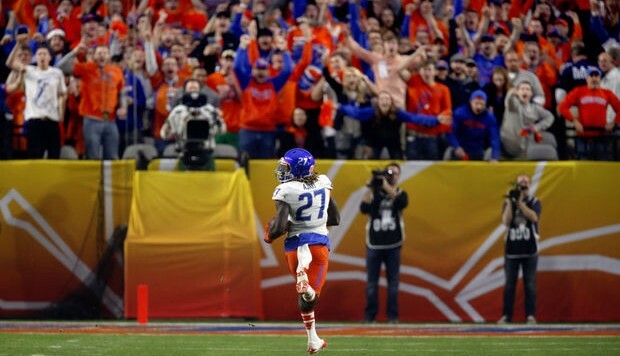 Ajayi has been the centerpiece of the Boise State offense, but Hedrick and the passing game needed to be good enough to get defenses off balance. In this game, Hedrick completed 17 of his first 18 passes and was able to hit receivers in the middle third of the field on intermediate routes. This wasn’t just a dink-and-dunk passing exhibition. Hedrick demonstrated considerable command, and given that he did so in a big game away from home marked an abrupt turnaround from the disastrous Ole Miss season opener and the no-show at Air Force. The ability of Harsin and the coaching staff to bring along Hedrick over the course of the season was just one more representation of how Boise State managed to be supremely resourceful even on a night when it left points on the field. Anchored by its defensive line, able to surmount mistakes, powered by a prepared quarterback, and all led by a coach not named Petersen. Boise State is here to stay. That’s what has to be said after a third time at the Fiesta Bowl was just as charming as the previous two.